Rock Mulching – The Best Mulch Technique Ever? 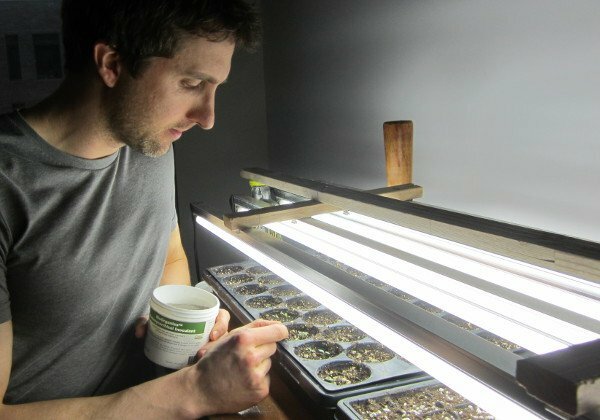 Starting seeds indoors for planting outside this spring – the inoculant goes on right before sowing the seed. Without sufficient beneficial microbes on (and in) our bodies, we get sick very fast. It’s the same for plants. Perhaps the most beneficial fungi for plant health is a group of fungi you may have heard me talk about before called mycorrhizal fungi. This week, I received a fresh batch of mycorrhizal inoculant, a powder that brings these fungi onto the roots of my plants. In addition to my regular inoculant, I now have a new inoculant that contains not only endomycorrhizal fungi, but also the ectomycorrhizal fungi that are needed by some trees such as oaks, some nuts and many conifers. Personally, I use a mycorrhizal inoculant whenever I plant or sow seeds – indoors or outdoors. It’s so affordable to use a pinch of powder each time I plant that I always do it even though it probably isn’t necessary in my garden anymore because I do my best to keep the existing fungi healthy so they stay around from year to year. That’s what this article is about today – how to maintain your garden to encourage the beneficial fungi in the soil to be as healthy as they can, because they do a lot of work for us in the garden. Phosphorus fertilizer. Don’t use too much, especially chemical phosphorus. When plants have ample access to soluble phosphorus (soluble means it dissolves in water, so is easier to take up by plants), they aren’t as reliant on mycorrhizal fungi, so they don’t allow the fungal infection to occur with their roots as much. That means by using soluble phosphorus fertilizer, we’re interfering with how nature provides plants with phosphorus, so we’ll need to take over the job of the fungi and continue to fertilize our plants every year. Even fresh manure can oversupply phosphorus. Rock phosphate is okay because it’s insoluble – it actually needs to be worked on by microbes such as these beneficial fungi in order for plants to most effectively use it. Other fertilizer. Other than phosphorus, overfertilizing in general can inhibit mycorrhizal fungi, so it’s good to fertilize just a little at a time. That’s why I often take the fertilizer recommendations from my organic soil lab and split it up into 2-4 applications during the year instead of all at once. Too much nitrogen seems to be the next big issue after phosphorus, and sulfur is another big one too because it’s antimicrobial. Many soils are deficient in sulfur, but if we use gypsum or potassium sulfate (both contain about 18% sulfur), that’s going to be less damaging to fungi than elemental sulfur (90% sulfur), which is much more soluble. Organic fertilizer. One reason organic fertilizers are nice is because they tend to either be rock fertilizers (such as the gypsum) that are very slow-releasing and therefore won’t cause as many problems, or are more broad-spectrum biological fertilizers (such as seaweed) that supply just small amounts of many different nutrient and therefore won’t oversupply any one nutrient. It’s still possible to overapply organic fertilizers, but they’re more forgiving. Pesticides. ‘Cide’ means to kill. Fungicides kill fungi, so using them can harm mycorrhizal fungi. But so can herbicides, insecticides and other pesticides. Just spraying a pesticide once isn’t going to knock out your whole fungal network, but repeated applications, especially of certain pesticides such as methyl bromide, will kill most of your microbial soil life (most countries stopped allowing methyl bromide use years ago, but the U.S. still allows it as of this writing). Anyway, I know I don’t have to speak much to this point on this site, because most of you are interested in organic gardening practices already. Mulch. Maintaining a consistent mulch of leaves, straw and perhaps some wood chips will provide protection and habitat for the fungi. I don’t like to use too many wood chips, but they do encourage fungi, so I will use them around trees and shrubs, which want a more fungal-dominated soil. A living mulch (a groundcover or cover crop) is also useful to give beneficial fungi more plants to partner with. Diversity. Mycorrhizal fungi benefit from having other microbes around, including beneficial bacteria, so while compost doesn’t provide the fungi itself, it does support them, as does using compost tea and effective microorganisms. Plant diversity is also beneficial, which is one reason why crop rotation can be helpful, and why leaving some weeds and wild areas to grow is, too. Water. Like us, fungi need water, but they also need air, so if your soil is so wet that there’s not enough air, the fungi will suffer. But even if your soil is just consistently moist (perhaps from your irrigation system watering for 15 minutes every morning), that’s also an issue because the fungi won’t have any reason to go searching deeper in the soil for moisture. We face the same issue with plant roots. We want roots and fungi to spread out and go down, so we need to let the soil dry out a little between waterings. Tilling. Tilling, plowing and double digging will slice your fungi up into pieces. It can sometimes be useful to do one of these when you’re first establishing a garden, but in the long run, it’s better to limit them to only when the benefits outweigh the downsides, which may be occasionally, or may be never. Sometimes they’re useful to lightly incorporate a cover crop or control weeds, but otherwise, less soil disturbance is usually better. Other soil disturbance. Topsoil removal during construction is devastating to fungi. Compaction is detrimental as well, as is erosion. On a farm, there’s usually more bacteria than fungi in terms of biomass (weight). In a forest, there’s 5, 10, 100, even 1000 times more fungal biomass than bacteria! Main reasons for this big difference are the lack of tilling/plowing, compaction and erosion in a forest, plus the lack of pesticides being sprayed, and the plant species growing there. So yes, applying an inoculant to your garden to bring in these beneficial fungi for plants can be very useful, as long as you’re addressing the above factors as well. Once you’ve done that, you generally don’t have to keep using the inoculant, although if I have some around, I still tend to when I’m planting and seeding new plants. If you have any questions about mycorrhizal fungi, you can head over to my main mycorrhizae page below and scroll down to the comments area to ask them there – that way we can keep all myco questions in the same place.